Looking for complete logo customization? No problem. We offer sweatpants with logos down legs, sides, and on bums. Get ready for awesome promo prices at great deals, with easy ordering and shipping right to your door. Ready, set, go. This Terry Pants are perfect addition to any workout wardrobe or casual attire. Drawstring sport pants bring your casual coolness to your closet. Full-length Joggers are perfect for exercising, athletics and even leisurewear. Features Back pocket along yoke seam. Suit up for a day of relaxing or working out inside these comfy Pants. The waistband with natural drawstrings provides adjustable snugness. Features an elastic waistband with a drawstring for a custom fit that’s sure to stay comfortable all day. This Pant contains organic & recycled materials. Elastic drawstring waistband provides a great fit for any body type. Designed with a rise differential and open cuffs for a comfortable and relaxed fit. Athletic shorts are the perfect addition to any workout wear or casual attire. Easy Elastic waistband with drawstrings to customize the fitting. The promotional men's Bash Elastic Waist Shorts have a covered elasticized drawstring waist that ensures comfortable fit. This promotional men's Determination Elastic Waist Pant has side pockets to store your essentials and a zippered bottom hem. 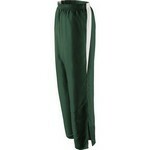 This promotional men's Exo Elastic Waist Pant feature easy-entry side pockets that allow storage of small items.